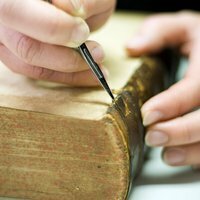 This training day will help librarians and archivists understand the types of bindings in their collections and will provide guidance on describing and handling bindings and on appropriate conservation techniques. This training day is aimed at librarians, archivists, volunteers, and anyone working with collections of historic bindings who would like to understand more about the books that they handle. 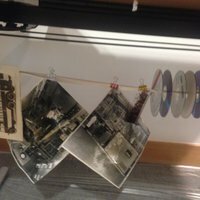 The first hands-on session will leave aside fancy decoration and the printed word, and will look at the structural features of a series of models, and hand-made bookbindings. Guidance will also be given on how to approach describing bindings. In the second session Arthur will examine three common modern binding styles, concentrating on the specific materials and techniques used in their construction and the various reasons why they might degrade. There will be a session on safe handling. The day will conclude with a tour of the basement which is kept at a cool temperature, so please bring warmer clothing. Coats and bags are not allowed in the store for security reasons but will be locked away. The day will conclude with a tour of the basement which is kept at a cool temperature, so please bring warmer clothing. Coats and bags are not allowed in the store for security reasons but will be locked away. 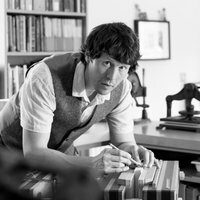 Arthur Green is an independent Book Conservator with particular interest in the history of the book. After five years working as a bookbinder he graduated with distinction from a Post Graduate Diploma in Conservation at Camberwell College of Arts in 2008. Arthur has published on bookbinding and conservation and started teaching in 2012. In 2016 he set up as an independent conservator and teacher, and currently has a studio near Malvern in Worcestershire.